Welcome back to DYSU for another round of fun! Did you guys have fun with the BIRDS challenge last week? It's time for another challenge and this week we're asking you to create something with an UNDER THE SEA theme! So, get your thinking caps on, and lets see your interpretation of SEA themes! My card this week was made using some Melonheadz images. I combined a few images and then sponged the background to create an under the sea scene. While I was making my card I realized I am out of practice with my sponging. I need to work a few projects with it to get used with the technique again. It's funny how we have all the techniques in our heads but if we don't practice there's no way our hands can do as told LOL! Here is my card. 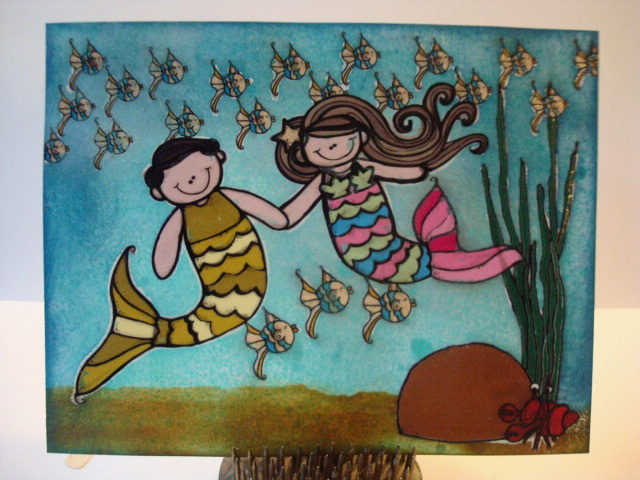 Hope you have a great day and see you at the DYSU blog with your under the sea creation!!! This is just fabulous. Love all the cute little fishes! This is adorable Joan. Love all those little fishes and your sponging looks fine to me. I would never guess you needed work with your sponging-it looks perfect to me! Terrific undersea card-so bright and fun! These two are adorable. i love how they are holding hands - so cute and the many fishes! Wow - what detail!